Grenada has taken over Chairmanship of the Cartagena Dialogue (Dialogue for Progressive Action), with a call by Minister for Climate Resilience, Sen. The Hon. Simon Stiell to direct the negotiation’s goalpost towards ambitious targets, in line with those in the Intergovernmental Panel on Climate Change (IPCC) special report: “As Minister of Climate Resilience, I know I have to move Grenada in a policy direction to resilient action as quickly as possible“. 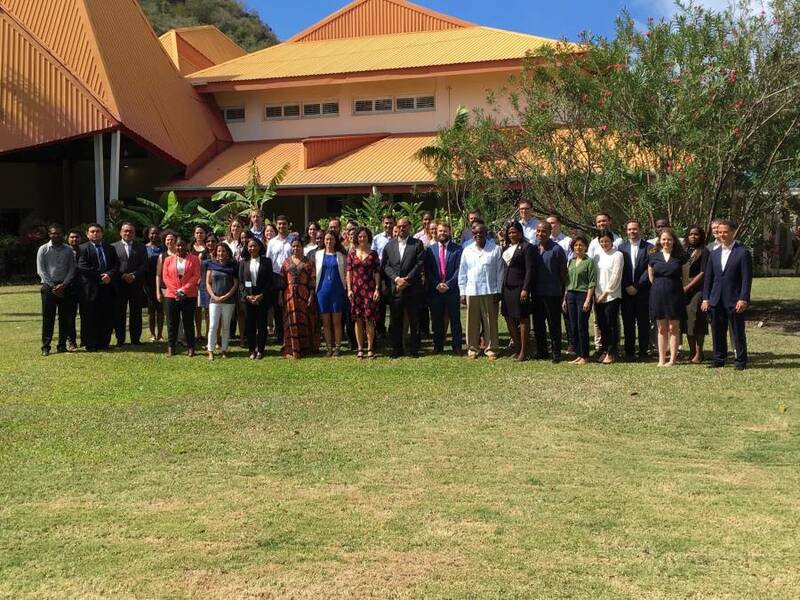 Sen. Stiell was addressing close to 60 senior level negotiators from 32 countries who participated in the critical climate change discussions known as the Cartagena Dialogue, at the Radisson Grenada Beach Resort. The group provides an informal space, open to countries who support ambitious and expeditious implementation of the Paris Agreement, and who are committed, domestically, to becoming or remaining low carbon. It contains the most progressive countries from the group of Small Island States, the group of Least Developed Countries, Latin American states, and key European Union Member States, amongst others. These are forward-looking countries, willing to work positively and proactively together, within and across regional groupings and traditional negotiating blocs in the United Nation’s climate change convention called the United Nations Framework Convention on Climate Change (UNFCCC). The aim of the dialogue is to openly discuss the reasoning behind each other’s positions and to explore areas where convergence and enhanced joint action could emerge. The event also provided an opportunity for Grenada to showcase its leadership position in the region in terms of progress in the climate change adaptation and mitigation agenda. Grenada is currently Chair of the OAS Inter-American Council for Integral Development (CIDI) with a focus on building resilience and reducing vulnerability and has just completed and handed over its Chairmanship of the Small States Forum (Oct 2018) and the OCES Council of Ministers of Environment (July 2018). Grenada used these leadership positions to lobby for an enabling environment for Small Island Developing States‘ (SIDS) to access assured, predictable streams of climate finance from the Green Climate Fund and other key sources for resilience action and to keep the Paris Agreement agenda focused on the 1.5° target. On the ground, Grenada is also at the forefront in the region, being the first country to prepare and publish its National Adaptation Plan (NAP) and to receive a Green Climate Fund-financed project in the area of water management.